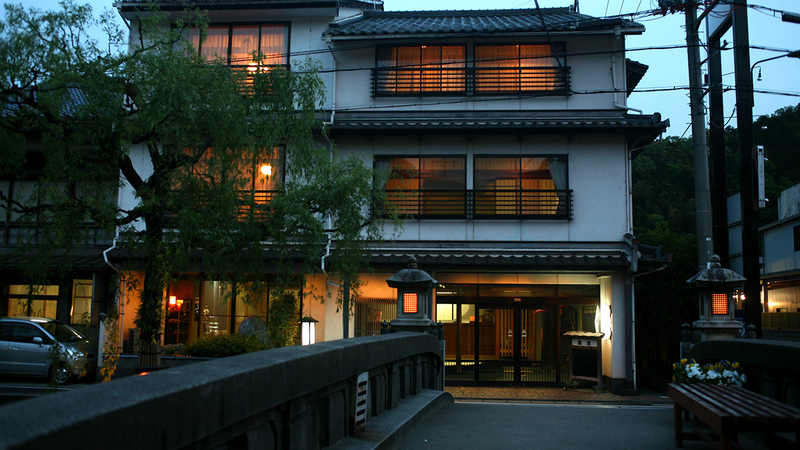 Japanese inn, Kawaguchi-ya is conveniently located along side Kinosaki Hot Spring's central river, Otani River. 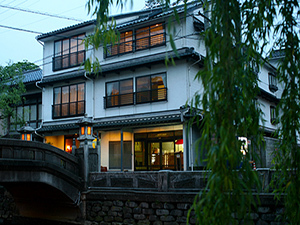 The building is fronted by a richly willow lined road and an arching bridge that crosses the Otani River. 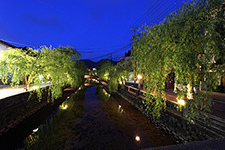 The “Taiko Bridge” that arches across the Otani River is one of Kinosaki’s most popular scenes to be photographed. 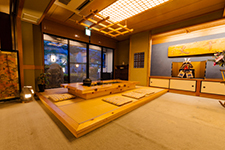 Additionally, the inn's great central location let's guests explore the town with ease and providesconvenient access to the town's seven open-air public bath houses. 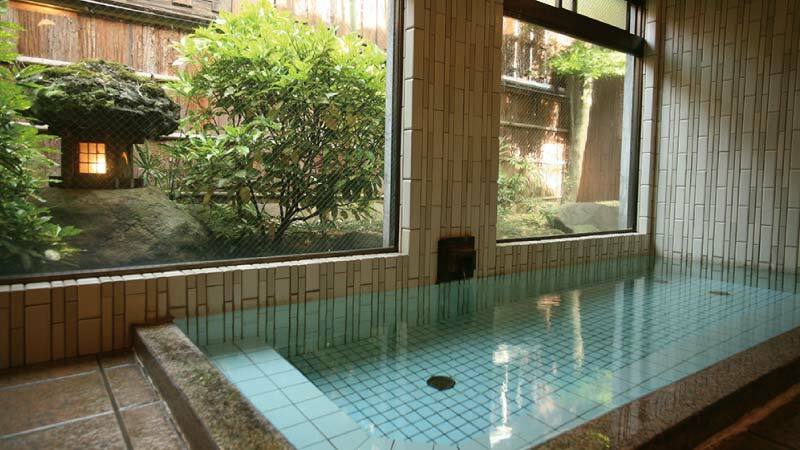 Guests are also welcome to spend an entire night leisurely soaking in the inn's communalbath(open from 4pm until 9am the next morning) or in the new private open-air bath, another popularchoice. 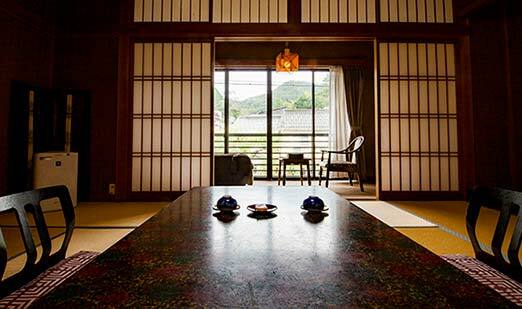 Along side the front desk in the lobby, just past the foyer, is a traditional Japanese hearth and place to purchase some coffee or tea. Enjoy your coffee or tea with your friends as you sit around the hearth. 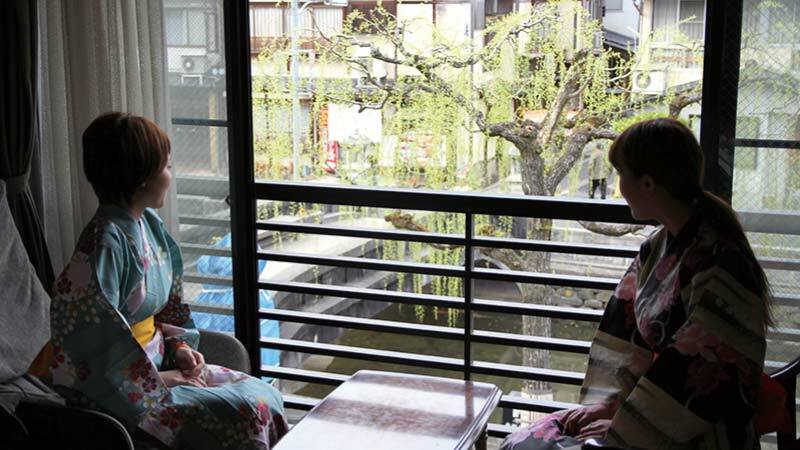 Ladies, you can also rent colorfully patterned yukatas(cotton, summer kimonos) to wear during your stay.We highly recommend exploring the hot spring town and visiting the bath houses while wearingyour yukata. Regardless of the season, the Otani River is always a beautiful scene. River side rooms (4 total) also come with Panasonic massage chairs. *For these rooms, please request a "river side room" when making reservations. There are rooms with both baths and restrooms, and some with only restrooms. If you would like a room with a bath, please request one in your reservation. 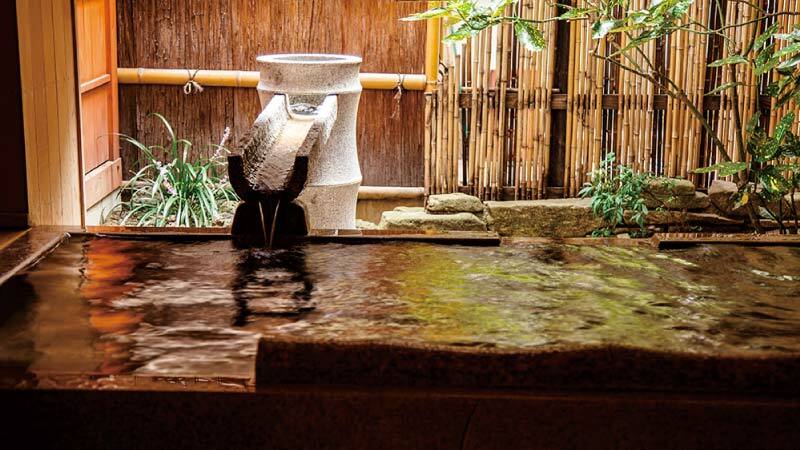 Recover from your tiring travels in one of our hot spring baths. The inn has three bathing areas. 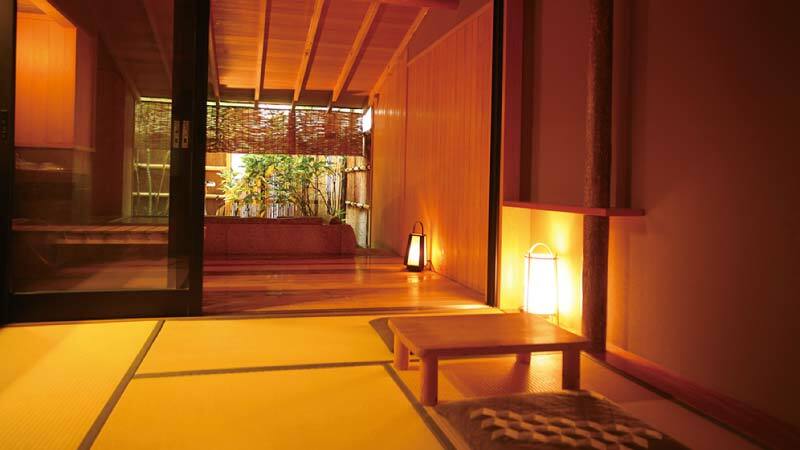 One is a private reservable open-air bath. 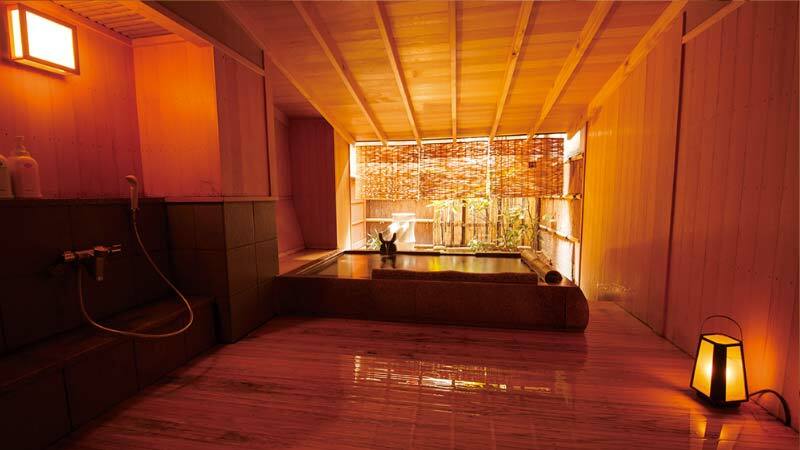 The other two are large communal baths, one area for each men and women. 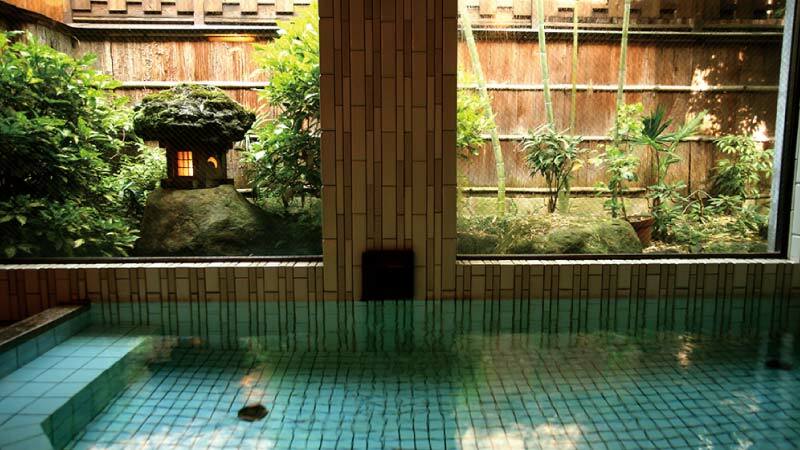 The soft candle like lighting of the open-air stone bath will sooth your body and mind. The soothing atmosphere is even more tantalizing in the evening. Reservations are required. 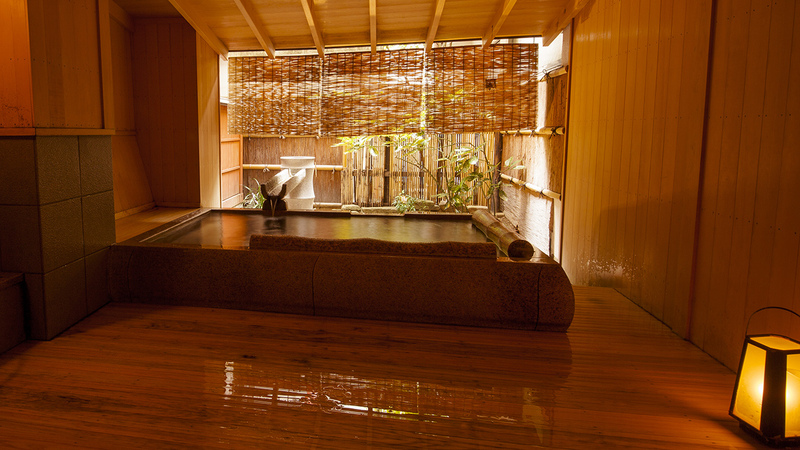 Each group is allowed usage of the bath for up to 45 minutes per reservation. Please ask the front desk about hiring fees. The large window in the women's bath area gives the bath an open feel. The men's bath also provides a generous amount of room for relaxing. 4pm to 9am of the next morning. These baths are open through the night. 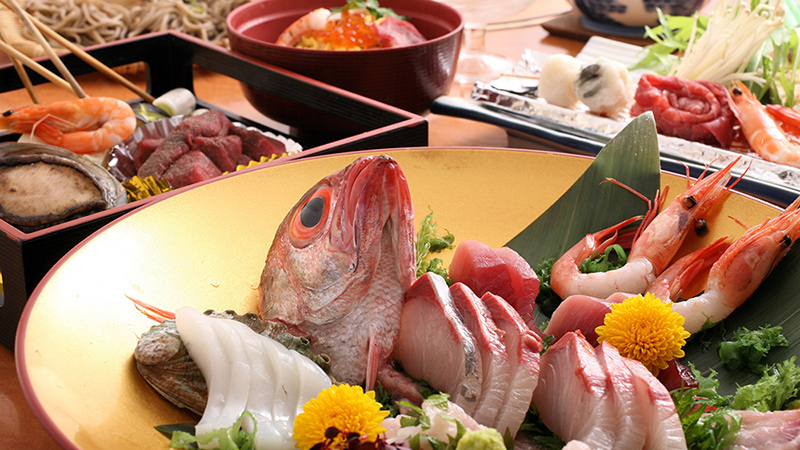 Enjoy your meal while dining in a private setting at Kawaguchiya's restaurant, "Benten". 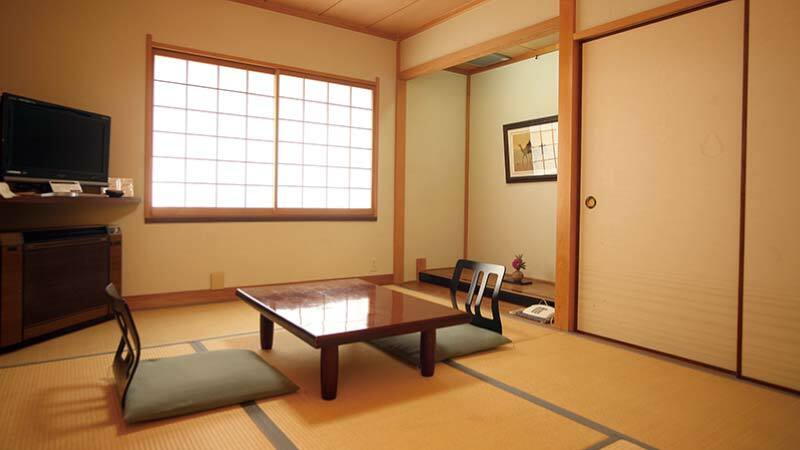 The restaurant’s seating is seperated into private booth like areas. 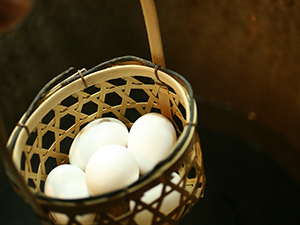 Wells, located under the tables,allow guests to sit comfortably with their legs droped down into the space provided. 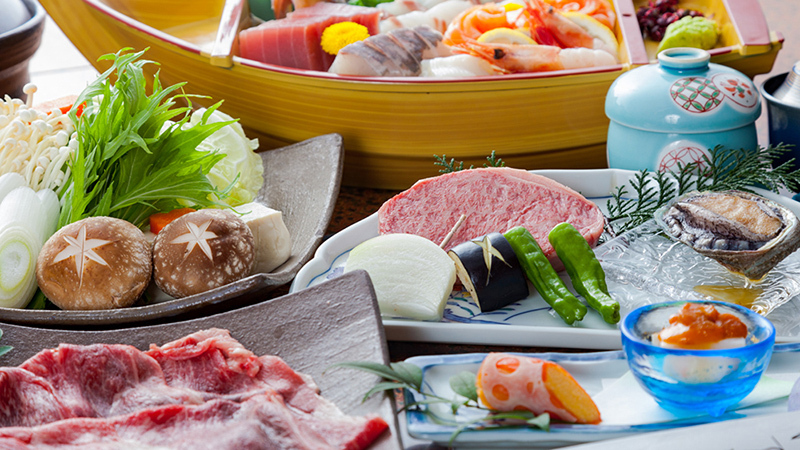 Try one of the many traditional Japanese dishes, everything on the menu uses local and seasonal ingredients. 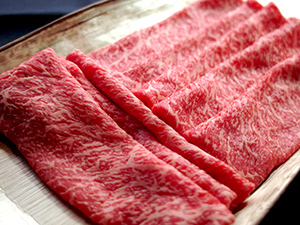 Tajima cattle, one of Japan's brand cattle, is famously known for being Matsuzaka cattle's and Kobe cattle's root. 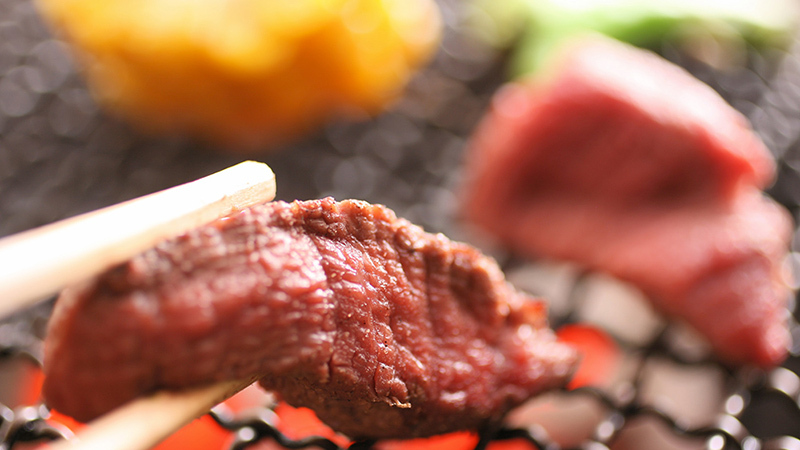 Tastes great served in a traditional as shabu-shabu or steak style. 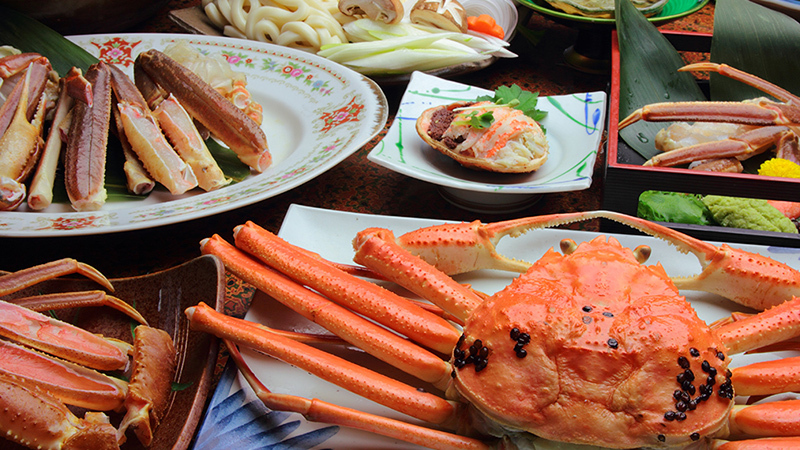 "Matsuba Kani(Snow Crab)" is served as the standard main dish during Kinosaki's winter season. 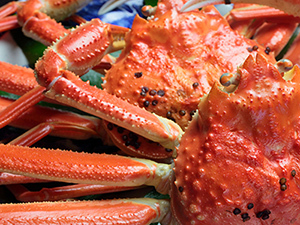 Available from November 7th until the end of March the following year.Try some snow crab that has been prepared in a traditional Japanese manner, such as sashimi style, boiled, grilled, stewed in a light broth and so on. 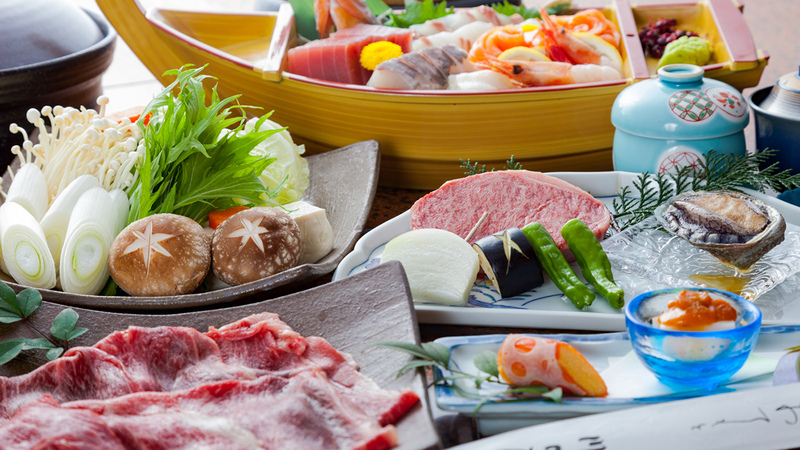 Other popular local dishes include charbroiled or sashimi style seafood, abalone, crab, meat and more. *Please notify staff in advance of any food allergies or dietary restrictions. 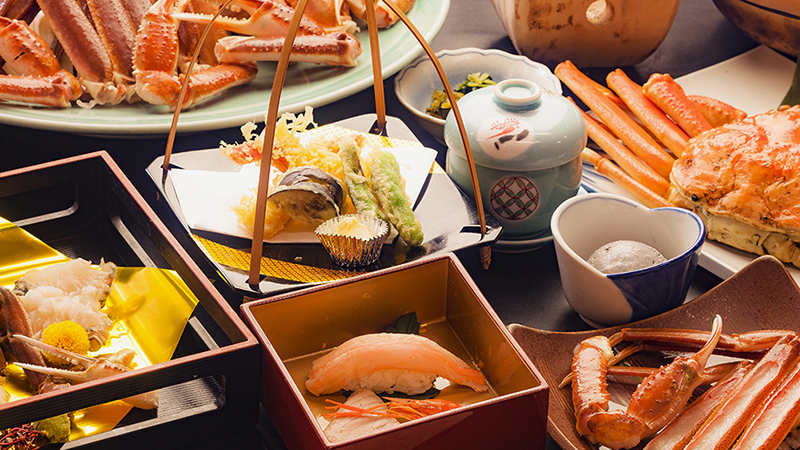 Guests with a meal-inclusive plan can enjoy a Japanese breakfast and dinner in the dining room Benten.A Western breakfast is available at advance request. 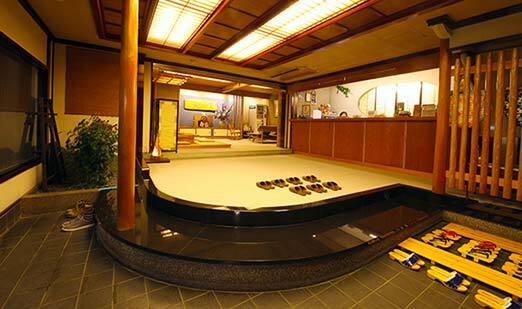 There is also a place where you can try making your own "onsen tamago (hot spring egg)". 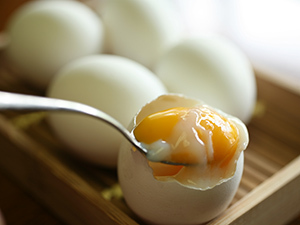 Boil your egg in hot spring water until the white is soft and the yolk slightly runny, but firm. 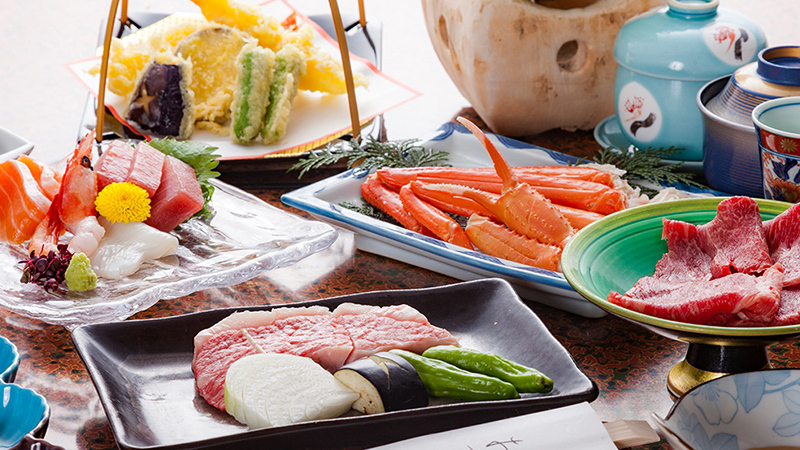 Colorful yukata, a colorful summerkimono made from light material. 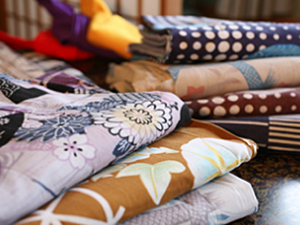 For the ladies, we offer a yukata rental service where you can choose a favorite, colorfully patternedyukata from our original selection. 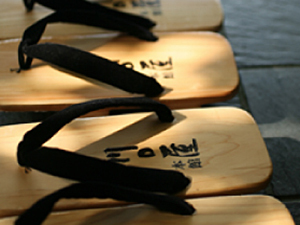 What better way to enjoy your time exploring the hot spring town than to do so while wearing a beautiful, traditional yukata and geta(Japaense wooden sandals). 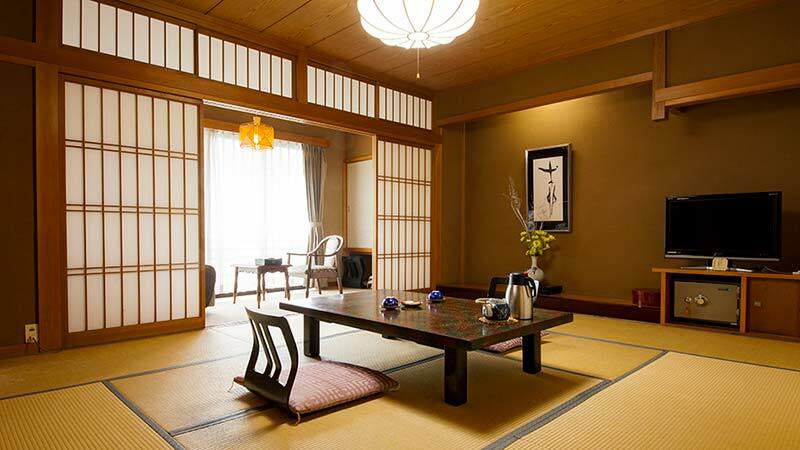 Ryokan staff will be more than happy to show you how to put on your yukata.